Birding Canarias: Monitoring the autumn migration of aquatic birds in the Souss Massa National Park, Morocco. Monitoring the autumn migration of aquatic birds in the Souss Massa National Park, Morocco. To understand the post-breeding migration of aquatic birds utilizing the western Atlantic flyway along the coastal region of Souss Massa Draa, the phenology of these species and the importance of this migration route, we carried out surveys in the mouths of the three main rivers basins of the region. 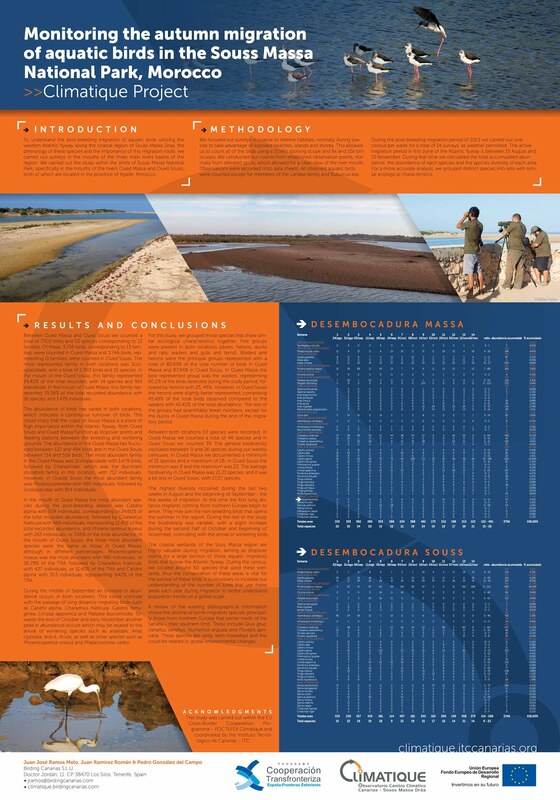 We carried out the study within the limits of Souss Massa National Park, specifically in the mouths of the rivers Oued Massa and Oued Souss, both of which are located in the province of Agadir, Morocco. We focused our surveys in coastal or riverine habitats, normally during low tide to take advantage of exposed beaches, islands and shores. This allowed us to count all of the birds using a 20x60 spotting scope and 8x and 10x binoculars. We conducted our counts from established observation points, normally from elevated spots, which allowed for a clear view of the river mouth. Observations were recorded onto data sheets. All observed aquatic birds were counted except for members of the Laridae family and Bubulcus ibis. During the post-breeding migration period of 2013 we carried out one census per week for a total of 14 surveys, as weather permitted. The active migration period in this zone of the Atlantic flyway is between 15 August and 15 November. During that time we calculated the total accumulated abundance, the abundance of each species and the species diversity of each area. For a more accurate analysis, we grouped distinct species into sets with similar ecological characteristics. Between Oued Massa and Oued Souss we counted a total of 7.502 birds and 53 species corresponding to 13 families. Of these, 3.756 birds, corresponding to 13 families, were counted in Oued Massa and 3.746 birds, representing 11 families, were counted in Oued Souss. The most represented family in both locations was Scolopacidade, with a total of 2.393 birds and 16 species. In the mouth of the Oued Souss, this family represented 24,40% of the total recorded, with 14 species and 914 individuals. In the mouth of Oued Massa, this family represented 39,38% of the total recorded abundance with 16 species and 1.479 individuals. The abundance of birds has varied in both locations, which indicates a continuous turnover of birds. This could imply that the coast of Souss Massa is a place of high importance within the Atlantic flyway. Both Oued Souss and Oued Massa function as stopover points and feeding stations between the breeding and wintering grounds. The abundance of the Oued Massa has fluctuated between 122 and 494 birds and in the Oued Souss between 114 and 558 birds. 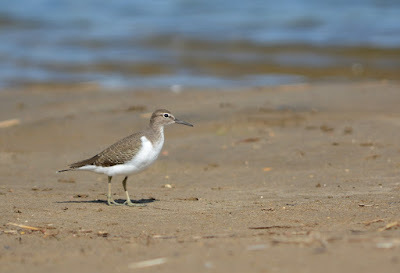 The most abundant family in the Oued Massa was Scolopacidade with 1.479 birds, followed by Charadridae, which was the dominant shorebird family in this location, with 712 individuals. However, in Ouedd Souss the most abundant family was Phoenicopteridae with 985 individuals, followed by Scolopacidae with 914 individuals. 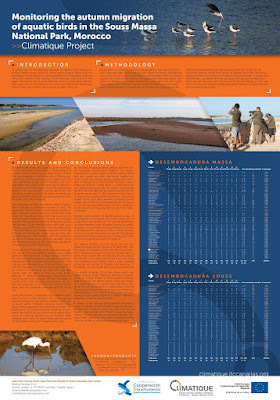 In the mouth of Oued Massa the most abundant species during the post-breeding season was Calidris alpina with 924 individuals, corresponding to 24.60% of the total recorded abundance, followed by Charadrius hiaticula with 466 individuals, representing 12.41% of the total recorded abundance, and Phoenicopterus roseus with 265 individuals, or 7.06% of the total abundance. In the mouth of Oued Souss, the three most abundant species were the same as those in Oued Massa, although in different percentages. Phoenicopterus roseus was the most abundant with 985 individuals, or 26.29% of the TRA, followed by Charadrius hiaticula, with 427 individuals, or 11.40% of the TRA and Calidris alpina with 353 individuals, representing 9.42% of the TRA. During the middle of September an increase in abundance occurs in both locations. 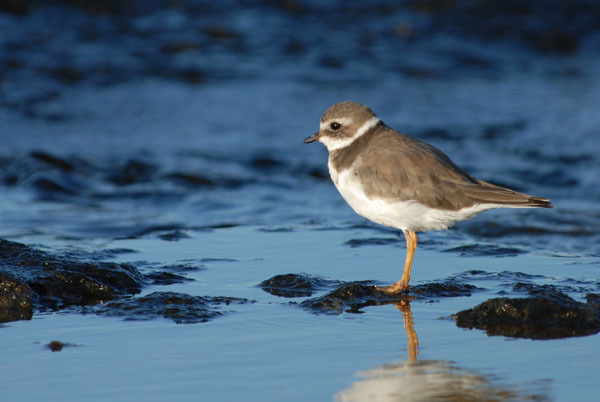 This could coincide with the passage of long distance migratory birds such as Calidris alpina, Charadrius hiaticula, Calidris ferruginea, Limosa lapponica and Platalea leucorhodia. Towards the end of October and early November another peak in abundance occurs which may be related to the arrival of wintering species such as anatidae, Anas clypeata, and A. Acuta, as well as other species such as Phoenicopterus roseus and Phalacrocorax carbo. For this study, we grouped those species that share similar ecological characteristics together. Five groups were present in both locations (divers, herons, ducks and rails, waders and gulls and terns). Waders and herons were the principal groups represented with a total of 85.69% of the total number of birds in Oued Massa and 87,94% in Oued Souss. 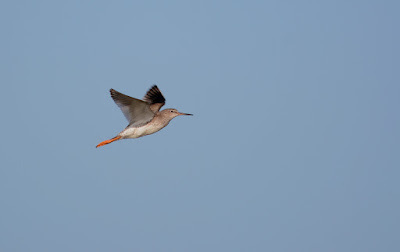 In Oued Massa the best represented group was the waders, representing 60,2% of the birds detected during the study period, followed by herons with 25, 49%. However, in Oued Souss the herons were slightly better represented, comprising 45,48% of the total birds observed compared to the waders with 42.45% of the total abundance. The rest of the groups had quantifiably fewer numbers, except for the ducks in Oued Massa during the end of the migratory period. Between both locations 53 species were recorded. In Oued Massa we counted a total of 48 species and in Oued Souss we counted 39. The general biodiversity oscillated between 9 and 26 species during our weekly censuses. In Oued Massa we documented a minimum of 15 species and a maximum of 26. In Oued Souss the minimum was 9 and the maximum was 22. The average biodiversity in Oued Massa was 21,21 species, and it was a bit less in Oued Souss, with 17,07 species. The highest diversity occurred during the last two weeks in August and the beginning of September - the first weeks of migration. At this time the first long distance migrants coming from northern Europe begin to arrive. They may join the non-breeding birds that spend the summer in the region. During the rest of the study the biodiversity was variable, with a slight increase during the second half of October and beginning of November, coinciding with the arrival of wintering birds. The coastal wetlands of the Sous Massa region are highly valuable during migration, serving as stopover points for a large portion of those aquatic migratory birds that follow the Atlantic flyway. During the census, we located around 60 species that used these wetlands, thus the conservation of these areas is vital for the survival of these birds. It is necessary to increase our understanding of the number of birds that use these areas each year during migration to better understand population trends on a global scale. A review of the existing bibliographical information shows the decline of some migratory species, principally those from northern Europe that winter north of the Sahara – their southern limit. These include Grus grus, Vanellus vanellus, Numenius arquata and Pluvialis apricaria. These species are rarely seen nowadays and this could be related to global environmental changes. Ramos Melo, J. J. & P. González del Campo. 2013. Resultados del estudio de la migración prenupcial de las aves de la región de Souss – Massa. Servicio de análisis de la migración de las aves a Canarias y otras zonas a través de la región de Souss- Massa-Drâa, en el marco del proyecto Climatique. Programa de Cooperación Transfronteriza España – Fronteras Exteriores 2008- 2013 (POCTEFEX). Fondo Europeo de Desarrollo Regional (FEDER). Unión Europea. Instituto Tecnológico de Canarias. Birding Canarias S.L.U. 153 pp. Ramos Melo, J.J., P. González del Campo, J. Ramirez & A. Delgado. 2013. Resultados del estudio de la migración de las aves de la región de Souss-Massa. Servicio de análisis de la migración de las aves a Canarias y otras zonas a través de la región de Souss-Massa-Drâa, en el marco del proyecto Climatique. MEMORIA FINAL. Programa de Cooperación transfronteriza España - Fronteras Exteriores 2008-2013 (POCTEFEX). Fondo Europeo de Desarrollo Regional (FEDER). Unión Europea. Instituto Tecnológico de Canarias. Birding Canarias S.L.U. 206 pp. Ramos Melo, J. J., J. Ramirez & P. González del Campo. 2014. Monitoring the autumn migration of aquatic birds in the Souss Massa National Park, Morocco. Climatique Project. 2013. Short communication. VII èmes Journées Internationales Oiseaux d’Eau et Zones Humides. « Ecologie et conservation des vertébrés des zones humides ». Grepon BirdLife/Moroc. Marrakech. April 2014. Rousseau, E. 2000. Les communautés d'oiseaux du Parc National de Souss-Massa (Maroc) : diagnostic écologique et implications en terme de conservation. Thèse EPHE, Montpellier. 158 pp. Thevenot, M. ; Vernon, R. & Bergier, P. 2003. The Birds of Morocco. British Ornithologists’ Union, Checklist series n°20, Tring, UK. 594 pp.